Xiegu's new X5105 is a compact portable HF & 50 MHz QRP transceiver with inbuilt general coverage SW receiver. The newcomer has a large LCD display, ATU and a 3800 mAh internal rechargeable battery. It offers radio amateurs high quality portable HF capability at a very affordable price. The X5105 boasts a large 3.6 inch dot matrix LCD display that takes portable operation to a new level. All the information you require is clearly presented, and the internal 3800 mAh battery can power the radio for up to 8 hours in receive mode. The compact size and light weight of the X5105 compare extremely favourably with its competitors. Its internal RF amplifier stage utilises two RD07MUS1 transistors in a push-pull configuration, to deliver up to 5 Watts over the full HF and 50 MHz frequency range. The X5105 will operate on a supply voltage of between 9 and 15 V DC, and smart battery management via microprocessor control ensure extended battery life. The effective inbuilt ATU lets you get up and running quickly without requiring a perfect antenna match. The ATU stores tuning data at 100 kHz intervals, allowing for instant retuning on previously used frequencies. The X5105's ergonomics have been optimised for field use: the front panel buttons are backlit for easy operation in low light conditions, while the stepped rotary VFO dial enables precise tuning with optimum sensitivity. The receiver is a double conversion superheterodyne type. Noise reduction, filtering and audio processing are all handled digitally by a high-speed 32-bit DSP unit. The internal clock source for the X5105 is a high stability TXCO, offering frequency stability at or below 2 ppm. In addition to voice modes (AM, NFM, LSB & USB), the X5105 can also be operated on CW. It has a built in keyer and the facility to store short CW messages. There is also a built-in microphone that can be used as an alternative to the handheld unit supplied. Other features include RIT and AGC controls, and an inbuilt preamplifier and attenuator circuit. 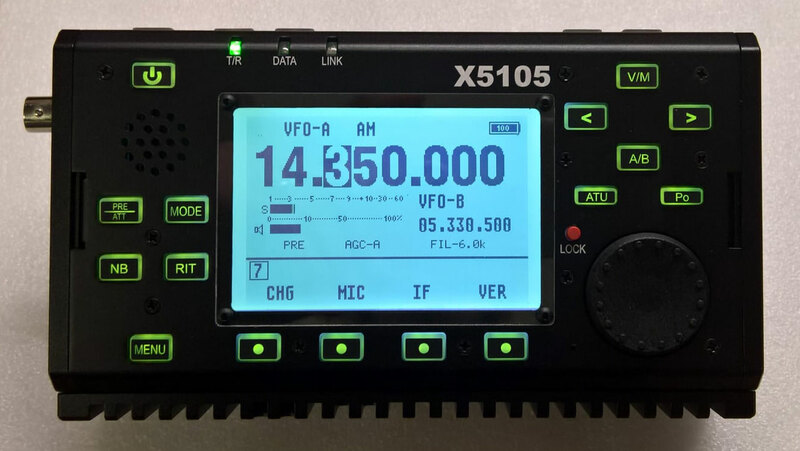 The X5105 also has an IF output which can be used with the forthcoming XDT1 panadapter to display the frequency spectrum and other information in color. A stereo headphone jack is provided, but please note that the output will not drive an external speaker without additional amplification. Mono headphones should not be connected as they may cause damage to the audio amplifier. The housing of the X5105 is a sturdy but lightweight aluminium extrusion, which incorporates a heatsink. It measures only 160 x 100 x 46 mm and weighs less than 1 kg in total, battery included. There are two flip-out legs that can be used to position the unit for desktop operation. Click HERE to visit the X5105 & X108G Facebook group. Its members have a wealth of experience with the radio and are always very happy to share their knowledge with new- or prospective owners. There is also an active Yahoo Group that can be found via any search engine. Please see the downloads page under Xiegu X5105.